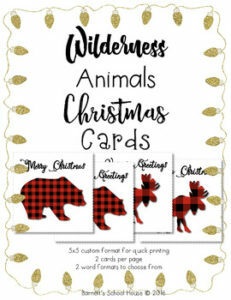 These cards are custom made by Barnett’s School House with unique clipart and beautiful font and we are excited to share them with you! Some ideas for these quick print cards are to hand them out to your colleagues or even your students! The best part about these cards are they’re unique and they’ll save you money on cards. Simply download the PDF file and save to your computer. Choose the PDF slide you wish to print whether it be a Merry Christmas or Season’s Greetings card, it’s your choice. Go to print and click, print current page as many times as you’d like. These cards are in a 5×5 format and you can find this size envelopes just about anywhere! Enjoy!